After last year’s deliberate – and successful – attempt to average over a gig a week, I made a bit less of a point of seeing live music at every opportunity this year. According to Songkick I made it to 41 or so shows, plus Indietracks of course (and very few in the last few months of the year, so I was probably maintaining the average up until then). At some point in 2013 I’ll go to my 400th gig – unfortunately my Songkick gigography isn’t quite accurate enough to let me identify which it’ll be, as the mists of time have claimed a few details… But that’s enough about 2013 – what about the year just gone? It started, as is now more or less a tradition, with the Fortuna Pop Winter Sprinter at the Lexington. I went to all three nights, and though I saw some great stuff every evening ultimately found it a bit of a slog; the event’s expanded to four nights for 2013… I’ll be going to two. 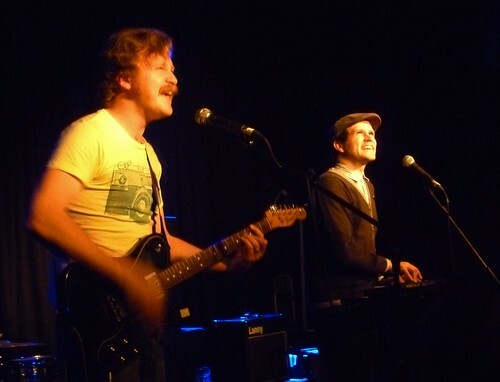 Highlights in 2012 included one of the last ever sets by Moustache of Insanity and a great set from the Singing Adams, with whom I book-ended the year a bit: my penultimate gig of the year was their album launch show at the Vortex Jazz Club in December. 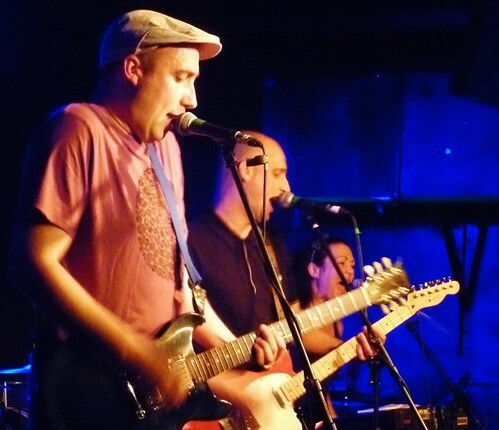 Also on at the Winter Sprinter were the Wave Pictures, who were tremendous; so much so that I booked more or less immediately for one of their three-night run at the Old Blue Last in Shoreditch in April, supported by Withered Hand. The latter was back in London, this time in full band mode, for a memorable gig with Darren Hayman at the Bull and Gate in September. This time Dan Withered Hand was battling the lurgy that would force him to cancel the rest of the tour, but adrenaline and a hugely warm reception from the audience buoyed him through what turned into an utterly triumphant set, performing most of the first album and ending with an unexpected encore of Heart Heart. 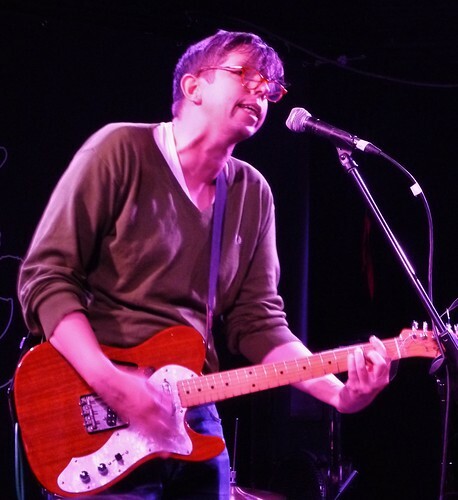 Darren Hayman’s solo slot was also terrific: his wry between-songs observations is now finely honed (it seems a bit wrong to call it banter; it’s more a set of observations on the world of gigs, and beyond). Having had a moment of realisation about not taking Hayman for granted during his excellent Indietracks set, I ended up seeing him four more times during the year – meaning I’ve seen him more times in 2012 than during the rest of his career, solo and Hefner combined. In full band mode he’s particularly impressive: the Long Parliament, as they’re now called, are a bit of a supergroup, featuring members of Allo Darlin’, Tigercats, Owl and Mouse and one or two others. Together they can floor the pedal on the more up numbers, but also deal sensitively with the more restrained and delicate material – it’s almost certainly the best line-up to have backed him. The other gigs were the launch show for The Violence at the Vortex on Bonfire Night, the launch show for Lido at the Lexington in August and, rather pleasingly, round the corner from where I now live, at the Rose and Crown in Walthamstow. Staying in the realm of male solo artists for a moment, one of the year’s great finds for me was Robert Ellis who, in addition to putting out my favourite record of the year, also played a couple of my favourite shows. He did a lot of UK performances this year, but both I caught were at the Windmill in Brixton (the second being the last show I’ll attend there, as the reports of the landlord hassling female performers have become a bit too much of a pattern for my liking), the first solo and the second with a small backing ensemble (guitar and pedal steel, I think). Ellis can hold a room, and the top quality songs just keep coming and coming. A particular highlight was a spellbinding rendition of the seven-minute song Cemetery, backed by guitarist Kelly “the Tele” Doyle, who had never played on the song before but improvised a beautiful, note-perfect guitar part to accompany it throughout. It was the sort of performance you watch live music to see. I owe my discovery of Robert Ellis to another gig at the Windmill. He wasn’t playing; rather his album, released that very day, was played between acts. I remembered the song What’s In It For Me so clearly that I googled it when I got home, and was surprised to find it wasn’t an old country standard. 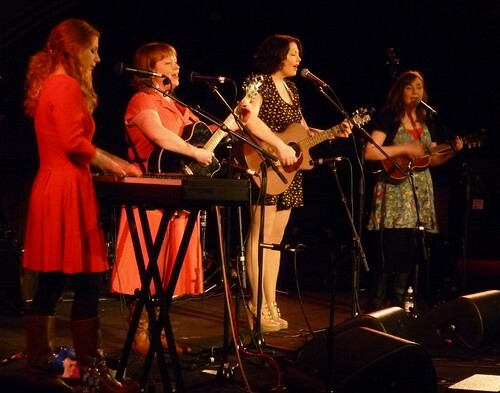 Anyway, the gig in question was the first of three times I saw the Cornshed Sisters – and the only one where they all sat down, seemingly preferring to stand from then on. Their unusual line-up allows them to reproduce their recorded output more or less note for note, complemented by a warm and at times excitable line of banter – well, Marie did used to be in Kenickie, you know. In fact it was nice to see a few die-hard Kenickie fans turning up for their shows – the third being a really delightful set at St Pancras Old Church – and a mini-reunion at the Brixton show, with Dr (as show now is) Emmy-Kate Montrose (as she used to be) in attendance. The middle of the three Cornsheds shows was at the Union Chapel, supporting the Futureheads. 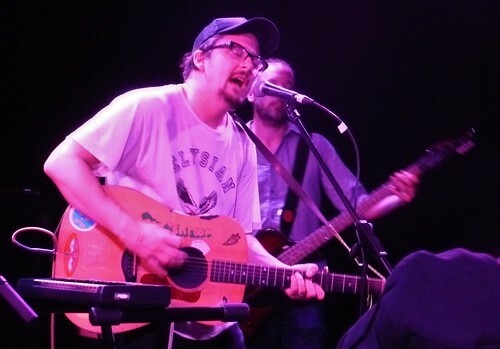 In touring Rant, they offered a lot of a capella numbers, but also some more acoustic numbers; they absolutely commanded the audience, making for a really impressive show (even if it did just sound a bit like skiffle in a few places). As ever, the Union Chapel was also the venue for numerous other really memorable performances: Ron Sexsmith solo in January; Piney Gir and Mara Carlyle at one of the Daylight Music shows in February (I also caught Piney again later in the year, still promoting her Geronimo! Album to great effect); and a tenth anniversary show for the Crimea in May, which represented a modest but well-earned triumph. If there’s a band who would do well at the Union Chapel, I feel sure the Just Joans would be one – someone put them on please! Still, I saw them twice this year, which on its own makes it a good year for live music. Their set at Indietracks was a predictable highlight of the weekend, and probably my favourite moment of the whole thing (they opened with Come Out 2Nite – the Kenickie thing never goes away, does it?). 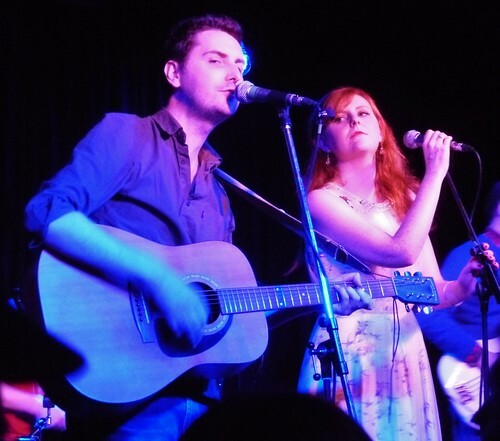 In February they ventured south for a rare London show at the Lexington, which was packed out with devotees eager to catch some rare Just Joans action. Quite brilliant it was, too – funny, moving, tuneful, everything you want; with plenty of singalong potential to boot. I daresay it’ll be a good while before I get to see them again. Bah. A rival to the Just Joans for position as my favourite live indie band were Shrag, who had plenty of shows around London this year… I feel a bit sad that they don’t really seem to be playing any bigger venues than two years ago – granted they’re a spiky and idiosyncratic proposition, but it should be able to find a bit of a bigger audience, I’d have thought. 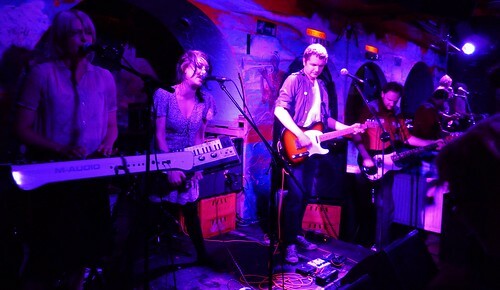 Fun though their set at the Shacklewell Arms in July was, for instance, it seemed a bit of a shame that one of the best bands in the country was plying their trade on a Sunday afternoon in the back room of an obscure East End pub. I know that’s the deal with indie music, but sometimes it does break through a bit – I hope it happens for Shrag at some point. They did play the London Palladium, mind – well, one of the side-rooms there, supporting the Lovely Eggs, who were also great fun. Extensive previewing at live shows meant that much of the new album was pleasingly familiar by the time I heard it, although I’m still a bit sad that it seems to have pushed the haunting The Habit Creep out of the live set. The weekend immediately before Indietracks brought a couple of unofficial warm-up shows of sorts, when Bis played their two reunion gigs in London. I ended up getting hold of tickets for both… perhaps it was a bit of an extravagance, I thought as I ambled into the first of them. As I emerged sweatily from it, I was extremely glad I’d done so – they were great! Less hair than in the past, but no less energy. And even one or two new songs, which were sounding pretty good to me. I’ve no problem with bands doing reunion shows like this for the enjoyment of it, and Manda’s health may unfortunately mean that they’re not able to keep doing shows over the long term (though I hope it doesn’t) – catch them when they’re next around. Staying with indie heros, MJ Hibbett’s long-running Totally Acoustic gigs wound down, for at least the next couple of years, with a strong run of monthly shows at the King and Queen. You can listen to it all on podcast, but highlights particularly included Elizabeth Allo Darlin’ in January (honestly, you could hear a pin drop), Peter Buckley-Hill in March, Frankie Machine and Gavin Osborn in May, and Pete Green at the final show. I’ve been going to these shows since they got going in earnest in late 2007, so it’s rather the end of an era. That said, Hibbett and Steve are back with a new Edinburgh show – Total Hero Team, which from the work-in-progress preview I’ve seen looks every bit as good as Moon Horse and Dinosaur Planet – so there’s more in a similar vein to come. From the smallest gigs of the year to the biggest I went to (I think): Elvis Costello and the Imposters at the Royal Albert Hall. Costello has resurrected his Spinning Songbook show from the mid-80s, in which audience members select the next song from a big spinning wheel. It added a great new dimension to what would otherwise still have been a great canter through the back catalogue (not just the obvious stuff either – a couple of cuts from Imperial Bedroom cropped up, which I’d never seen him do before). Perhaps a bit more Spinning Songbook and a bit less encore would have been preferable – finale (What’s So Funny ‘Bout) Peace Love and Understanding lasted about ten minute (it seemed) with a dozen or more musicians on-stage; fun, but a bit more weight than the song could really bear. Earlier, he’d announced a very special guest… Russell Crowe! Very droll, I thought; I wonder who the special guest really is? No – it actually was Russell Crowe! Not quite in the same league of awfulness as Old Crow Medicine Show introducing Mumford and Sons for an encore, but still pretty bizarre! It was a long old show, and Costello was getting a bit croaky by the end, but all told it was great to see him doing such a fun, distinctive show with the back catalogue. 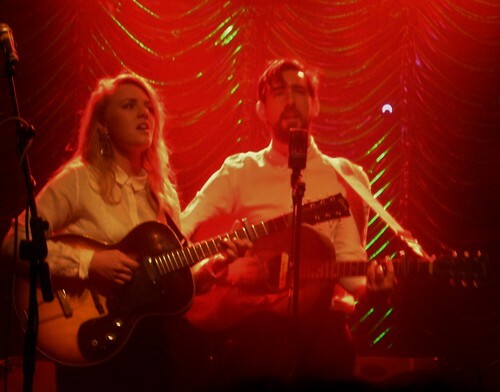 As last year, the final gig of the year was Slow Club’s annual Christmas show, transplanted now from the Union Chapel to Koko, and perhaps falling very very slightly short in the atmosphere stakes for that reason. But it was still an impressive triumph for a band who haven’t had a record out this year, and who continue to dazzle live – they’re heading into the studio now to do the new album, and on the evidence of the new tracks previewed that night it looks sure to be one of the highlights of 2013. No doubt I’ll be seeing them again in the year ahead. Also on the horizon is another Winter Sprinter (Withered Hand and Herman Dune on the same night! Shrag and Darren Hayman also sharing a bill! ); shows by Old Crow Medicine Show and Erin McKeown (both on February 4th – how annoying! ); and another visit to these shores by Caitlin Rose as she releases her new album. And that’s just the stuff I already know about – I can’t wait to see what else 2013 has in store.